Our 2018 review series continues with statisticians A Lennart Julin and Mirko Jalava looking back at the jumps. The men’s high jump season in 2018 was a broken one for the top jumpers. The reigning world champion, Mutaz Essa Barshim, started the season well clearing a 2.38m world indoor lead in his first competitions of the season at the Asian Indoor Championships in Tehran. The 27-year-old Qatari was beaten at the World Indoor Championships in Birmingham in March, where authorised neutral athlete Danil Lysenko won with a third attempt 2.36m clearance against Barshim’s 2.33m. Lysenko had jumped 2.37m before the championships and won the silver medal in London 2017 behind Barshim. Outdoors Barshim started strong, topping 2.40m in Doha in May, followed by 2.36m in Eugene, 2.36m in Oslo, 2.38m in Ostrava and another 2.40m clearance in Székesfehérvár at the start of July. But that was it for the Qatari as injury ended his season prematurely when he damaged his ankle ligaments on his final try at a 2.46m World record height in Székesfehérvár. Lysenko wasn’t as stable outdoors as he was indoors, but did jump 2.36m in Ostrava in June before winning with 2.37m in Lausanne in July before equalling Barshim’s 2.40m world lead and personal best win in Monaco in July. 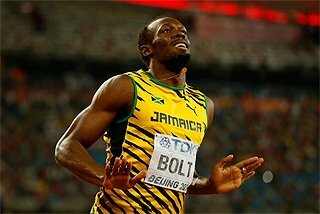 However, his season ended when the IAAF Doping Review Board revoked his ANA status at the start of August. With the two top names sidelined, Australian Brandon Starc took the Diamond League title in the event to cap a season in which the 24-year-old won the Commonwealth title in April and topped a 2.36m Oceania area record in Eberstadt in August. At the European Championships in Berlin German Mateusz Przybylko delighted the home crowd by equalling his 2.35m personal best to take gold. It was clear from the start of the campaign that to top the men’s pole vault rankings at the end of this season, one would have to jump high. Frenchman Renaud Lavillenie grabbed his third world indoor title in Birmingham with a 5.90m result, but outdoors that kind of result would not be enough for top placings. The 32-year-old himself started well outdoors too, winning with 5.95m in Austin, Texas, in April. Armand Duplantis, just 18, won the Louisiana High School title with 5.93m in May. The Swede had already established himself as a top vaulter last year, when he jumped 5.90m in Austin at the age of 17. This summer his form carried well into the European season as well. The youngster jumped 5.86m in Stockholm in June followed by 5.91m in Montreuil and 5.90m in Paris and was one of the favourites before the European Championships in Berlin. The Berlin final was something else though, much better than anyone could have expectd. Pole Piotr Lisek lead the competition at 5.90m, but miraculously was left outside the medals at that height. 5.90m equals the best result not to win a medal at any major championships; the only time this happened before was at the 2000 Olympics in Sydney when Michael Stolle (GER) also placed fourth with 5.90m. Lavillenie lead the competition alone at 5.95m, but it was far from over, with the Frenchman ending up with a bronze medal, again the highest ever result for a third place finish at a major championships. Previously, that was 5.92m by Andrei Tivontschik (GER) at the 1996 Atlanta Olympics. At 6.00m it was authorised neutral athlete Timur Morgunov and Armand Duplantis tied for the win, but the 18-year-old had one more ace in his sleeve, flying high over 6.05m too, with his first attempt to break the world U20 record and becoming the youngest gold medallist, medallist and even finalist in the history of the European Championships. That height also ties the best result to win a major title. Previously Dimitri Markov (AUS) cleared the same height winning the 2001 world title in Edmonton. The 21-year-old Morgunov became the first athlete not to win a major championships gold medal after having topped 6.00m and the fourth athlete ever to lose a competition having cleared six metres. Morgunov also won the pole vault Diamond League competition. Last year Luvo Manyonga brought the men’s long jump back to a higher level jumping an 8.65m world lead with a total of four competitions over 8.60m. While the South African was just a bit behind his 2017 standards this season, he played a big part in how the 2018 summer became the event’s best in a very long time. Eight athletes combined for 25 wind-legal meetings at 8.40m or better, the third best ever. 1995 had 26 competitions and the best year, 1997, 27 at 8.40m or more. The number one jumper in 2018 was young Cuban Juan Miguel Echevarría, who won the World Indoor Championships in Birmingham with 8.46m. The 20-year-old then exploded to a phenomenal 8.83m jump in Stockholm in June, with the wind just over the limit at +2.1 m/s. A further 8.66m personal best in Ostrava and finally an 8.68m PB and world lead in Bad Langensalza made him the best long jumper of the season, winning eight of his ten competitions. Manyonga, 26, was crowned the Diamond League champion. He lost world indoor gold by just two centimetres, taking silver with an 8.44m African indoor record. He won three Diamond League meetings, including an 8.58m win in Rome in June, his best jump of the year. Wang Jianan (CHN) equalled the Asian record of 8.47m in Guiyang in June and Ruswahl Samaai (RSA) won the African Championships with 8.45m in Asaba in August. Greek Miltiádis Tentóglou was the best European in Berlin winning the gold with 8.25m. The men’s triple jump season was a duel between double Olympic champion Christian Taylor of the US and Pedro Pablo Pichardo, who acquired Portuguese citizenship in December 2017. Both athletes won two out of their four clashes during the summer, but Pichardo was the best in the Diamond League winning the overall series title. Indoors the fight for the world indoor title in Birmingham was extremely tight. Just three centimetres separated the medallists with American Will Claye winning his second world indoor crown with a 17.43m leap. Brazilian Almir dos Santos, 25, was just two centimetres behind with a 17.41m indoor best with 2008 Olympic and 2007 World champion Nelson Évora (POR) third with 17.40m. Pichardo produced the best jump of the season already in May in Doha with 17.95m while Taylor too jumped his best mark in the same competition, jumping 17.81m for second. Later in the season results dropped with Taylor winning the IAAF Continental Cup in Ostrava with 17.59m. Notable also were performances by 17-year-old Cuban Jordan A. Díaz. The 2017 world U18 champion bettered the U18 world best twice, first with 17.32m in February and then 17.41m in June before winning the World U20 title in Tampere with 17.15m in July. 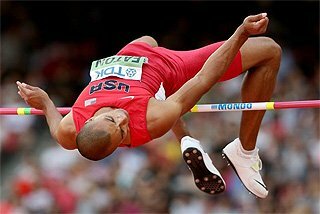 The first two-metre jump came more than 40 years ago but it has remained the major barrier as very few jumpers have managed to become reasonably consistent at the two metre-plus level. 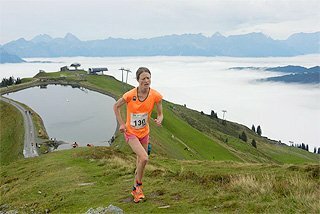 Currently Mariya Lasitskene is unique in that capacity: The last two years combined, counting both outdoors and indoors, she has produced 32 performances at 2.00m or better while all others combined have totaled seven. However, while Lasitskene last year outjumped all opposition (i.e cleared a higher height than the runner-up) in every meet she did lose once (Rabat Diamond League) and in both Stockholm and the European Championhips she won only on countback as Mirela Demireva, the Rabat winner, matched the winning heights of 2.00m. But the toughest challenge came in the London Diamond League where Lasitskene didn’t seal the victory until clearing 2.04m. That was because Elena Vallortigara – coming into the meet with a 1.96m PB – cleared both 2.00m and 2.02m on her third attempts. Vallortigara, 26, who as a promising teenager took bronze at both the World U18 and World U20, was the sensation of the year after her progress had for years been hampered by a string of injuries. Her personal best until this spring remained her 2010 Italian U20 record of 1.91m. A perfect inspirational example for recent teenage talents such as Yuliya Levchenko, Morgan Lake and Vashti Cunningham, that now during their transition to the senior ranks experience slow-downs in their progress. Then there is Nafi Thiam who statistically is up there with a 2.01m personal best from the Götzis heptathlon in May. But will Thiam ever find time to fully explore her high jump potential? So far she has squeezed in just a couple of pure high jump competitions per year and all but one of her seven 1.95m-plus marks are from combined events. The last few years have seen a distinct ”second surge” in this event which celebrated its 20th year on the international senior championship programme. 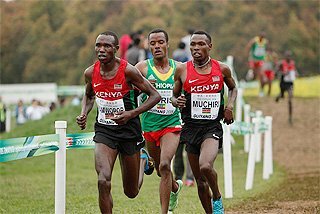 If you compare the outdoor world lists of 2014 (the previous year without a global championship) and 2018 and look at the number of athletes surpassing 4.90m, 4.80m, 4.70m and 4.60m respectively they have gone from 0 to 3, from 1 to 9, from 6 to 14 and from 12 to 26! The reason probably is that the first generation ”growing up” with the event – i.e. 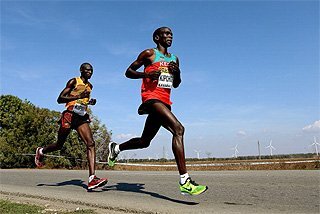 those born in the early 1990’s – are now in their prime athletic years. 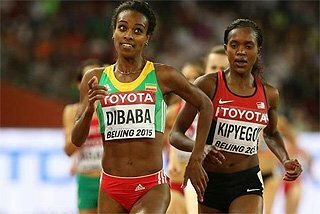 Top representatives of that group are Sandi Morris and Ekaterini Stefanidi who both have medalled in all four global championships held from 2016 onwards and who also have occupied the two top places in the Diamond League finals during this period. During the summer New Zealand’s Eliza McCartney --still only 21-- went even better raising her PB first to 4.92m in June and then to 4.94m in July and looked set to challenge the 5.00m barrier. 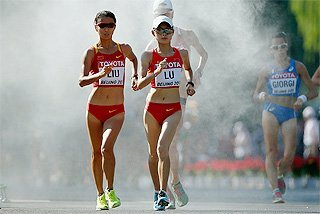 That challenge, however, never materialised as McCartney’s season was cut short when she injured herself in a failed attempt at the Birmingham Diamond League. 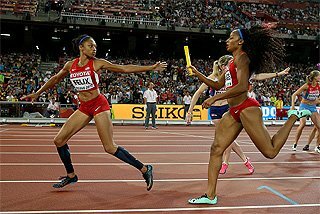 But given the current trend we probably quite soon will see the ”Five-metre Club”, now consisting of just Yelena Isinbayeva (2005), Jenn Suhr (2013) and Morris (2016), grow. At the 2017 World Championships the top-four were Britney Reese, Darya Klishina, Tianna Bartoletta and Ivana Spanovic. But during ”summer prime time” this year all of them were missing: Reese, Bartoletta and and Spanovic ended their outdoor seasons prematurely while Klishina took the whole year off. With the ”old establishment” gone there was a void at the top ready to be filled by someone from the next generation. Who could then have guessed that it would be a 34-year old ”newcomer” to the event laying claim to the vacant top position. The career of Caterine Ibarguën is absolutely extraordinary: She started out as a high jumper and at age 15 competed at the 1996 World U18 championships. When progress halted at the 1.90m-level she at age 26 switched focus to the triple Jump to quickly find success, actually ruling the event from 2012 onwards. Being so successful in the triple jump she competed exclusively in that event internationally since 2013. But this year at age 34 the Colombian decided to venture into the long jump and must have surprised even herself by the outcome: six meets, all between 6.77m and 6.93m, four wins, one second and one third place And the last two triumphs were at the Diamond League final and the Continental Cup, with both coming the day after wins in the triple jump. Of the specialists Germany’s Malaika Mihambo had the best season overall: Five meets at 6.85m or better spread from late May to early September, wins at the European Championships and two Diamond League meets plus second at the Continental Cup. World leader Lorraine Ugen, who jumped 7.05m in early July, was not able to carry that form to the season climax in August and ended up ninth at Europeans and sixth at the Diamond League final. 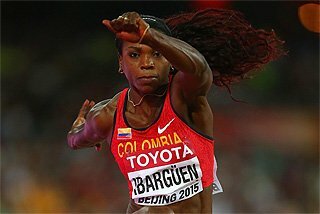 Would Caterine Ibarguën become more vulnerable in the triple jump when she began spreading her ambitions to the long jump? The answer was a definitive ”No”. For the fourth year in her career (previously 2013, 2014 and 2015) she remained undefeated winning all eight outings, which brought her win-loss record for the last six years to 52-4. 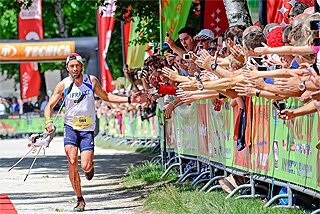 With one exception Ibarguën’s wins were emphatic with the gaps of a quarter of a metre or more to the runner-up. 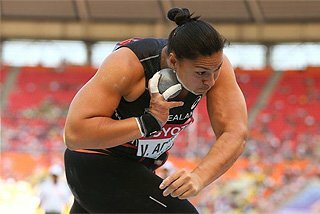 The exception was the Diamond League final in Zürich where she prevailed by just one centimetre over Shanieka Ricketts with 14.56m. Venezuela’s Yulimar Rojas – Ibarguën’s junior by almost 12 years – established herself in 2016 as the foremost challenger raising her PB over 80 centimetres to surpass the 15 metre-barrier and finishing second in the Rio Olympics. 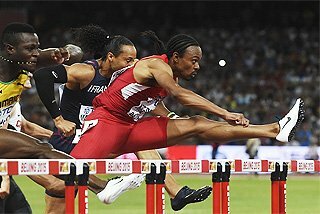 Last year Rojas even snatched the world title from Ibarguën in a supertight battle in London, 14.91m to 14.89m. In 2018, however, injury problems kept Rojas out of action except for the World Indoor Championships where she defended her 2016 title in the absence of Ibarguën, whose only indoor meet seems to have been the 2006 World Indoor Championships when she was still a high jumper. Hopefully a fit Rojas will return to the triple jump scene in 2019. Otherwise there is no apparent immediate challenge to Ibarguën’s supremacy. As usual there is a cluster of jumpers around 14.50m but the step up towards 15 metres has proven quite tough to achieve. Perhaps Tori Franklin could do it? After several years of consistency in the mid-to-high 13 metre range, the American now at age 25 suddenly lifted to consistency in the mid 14’s, topping it with a 14.84m national record.